Spring is here, and birds around the world—and in your backyard—are turning into construction crews. It’s nesting time! Many songbirds are master builders, putting together intricately made weavings of twig and leaf, stem and fluff, hair and moss. Some nests, like the Baltimore oriole’s, will hang from a tree branch like a small tote bag. Others, like the robin’s, are cups bristling with twigs painstakingly collected one or a few at a time. Even if you provide birdhouses in your garden, the birds that occupy them will build nests in them. A chickadee in Southampton, New York, plucks nesting material from a coco mat put over a trellis by Victoria Reith, who took this photo for the 2013 National Wildlife Photo Contest. So, what can you do about it? Well, you can provide nesting material of a wide variety of types that appeal to a wide variety of birds, attracting avians to your garden as surely as you would with a feeder. You have two ways to provide nesting materials: You can grow plants that offer construction goods, or you can offer raw items. National Wildlife Photo Contest entrant Joey Herron watched on as this house wren struggled—successfully—to bring this large twig into its nest. For birds looking for small twigs, almost any tree or shrub you plant will do. When small branches or twigs fall from a shrub and gather at its base, leave them for birds to pick up, preferably in lengths under 4 inches. Some birds line nests with soft plant matter. You can provide this accoutrement by growing catkin-bearing trees and shrubs such as cottonwood, maple, mulberry, willows, poplar and beech. Many birds—hummingbirds spring to mind, but other songbirds as well—gravitate toward fluffy material, such as seeds with silky attachments designed to waft them on the wind or seed pods with a soft, hairlike covering. You can provide these items via cottonwood trees, lamb’s ear (ground cover), milkweed (also good for attracting monarch butterflies), honeysuckle, and clematis. If you have a pesky spot in your garden that refuses to grow anything but dirt, try adding a little water and see if you can grow mud. Mud is a favored nesting material for swallows and swifts and even the common robin. When you trim your yard, perhaps you can find a spot in your garden for laying out a selection of dried grass stems cut 2 to 4 inches long. Grass is a common ingredient in songbird nests, used by species from native sparrows to robins. If you have a shady spot in your yard, trying growing moss; with its velvety green growth, moss is a beautiful highlight for any moist garden and is a favored building material of some hummingbird species. Photo donated by National Wildlife Photo Contest entrant Carol Matthai, who captured this image of an American robin collecting sticks and fluff for nesting material. Almost any kind of fur or wool will do. Dog fur is probably handiest for most people, especially when dogs are shedding in spring. Curry them, take the fur off the brush, and put it in your garden (we’ll talk below about ways to distribute it). If you use goat hair or wool from a sheep, cut longer pieces into 4- to 6- inch lengths. Animal fiber works well for nesting, because it is durable and not inclined to soak up water. Just don’t use any fur that has been treated with flea dips or insect repellents. Please do not try to provide human hair for birds! Human hair is so thin that it can easily wrap around birds legs and necks, cutting off their circulation and causing serious injury or death. Who doesn’t have a few snakeskins lying around going to waste? You don’t? Well, okay, but you never know when a snake might shed its skin in your yard. If you find one these integumentary artifacts—looking like thin, almost transparent parchment—hang it in a tree or shrub where a bird may find it and apply it to its décor. You can offer fabric, yarn, twine or string made of natural fibers such as raw cotton, hemp, sisal or wool. These natural fibers won’t retain water in the nest, will eventually deteriorate naturally over time, and are similar to the fibers birds would find in the landscape. 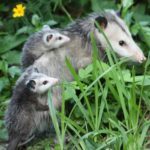 Cut them into one-inch-wide strips and in lengths under 6 inches long, and put them where birds will find them, such as on tree and shrub branches. Don’t use synthetic fibers or long lengths, which, like hair, can tangle and injure birds. Laundry dryer lint. The lint collected in your dryer filter may seem like ideal nesting material, but it isn’t. It will soak up water and may be steeped with chemicals unhealthy for birds, such as remnants of detergent and softener. So you have a collection of wool, dog hair and strips of natural fibers. How do you do deliver it to birds? My favorite method: Cram a mix of the items into a suet feeder, giving songbirds access to a smorgasbord of building basics. Or, fill the head of a kitchen whisk with the various materials and hang the whisk by its handle from a tree or shrub. Do-it-yourselfers might like to check out a design for an easily made wire holder. Aside from bribing them into your garden with foodstuff, providing nesting material is one of the best ways to attract spring and summer birds. If you offer it, they will build. 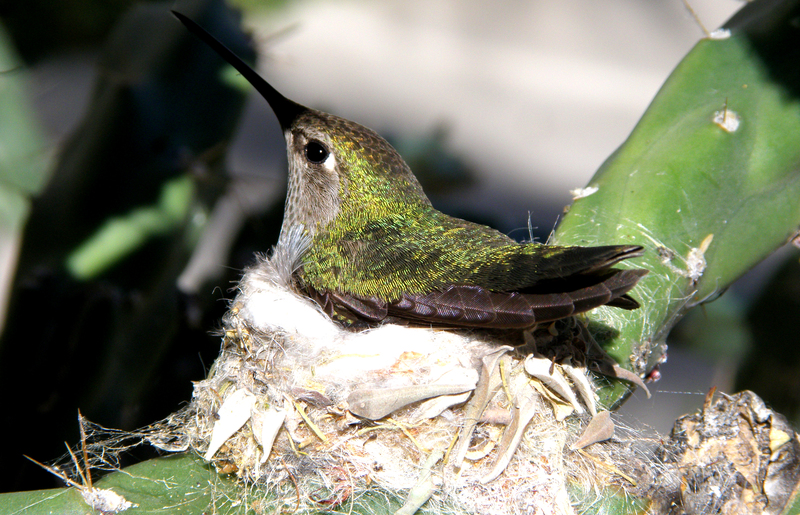 This hummingbird has edged its nest, in Mesa, Arizona, with fluffy material that may include spider webs. Photo by Kevin Blondelli.